In today’s threat landscape, skilled, organized, well-funded cybercriminals are working to steal your data — the lifeblood of your digital business — in pursuit of economic, political, or military gain. To combat this, security leaders can implement a zero-trust model. With Zero Trust, you can develop robust detection and incident response capabilities to protect your company’s vital digital business ecosystem. 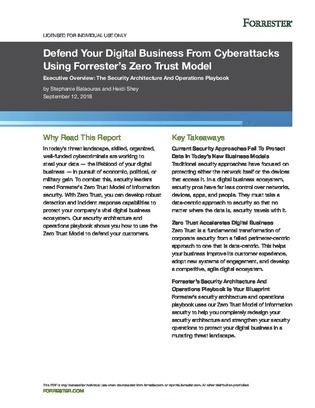 Download this Forrester Executive Overview to explore how to use the Zero Trust Model to defend your customers.